Research scientist Jacob Haqq-Misra wrote an article that appeared in the Boston Globe on September 11, 2016 about the origin of life called "A better theory of intelligent design". (I wonder why something of this nature was in a newspaper like that instead of in a more specialized publication.) Makes it sound like something new and impressive, what with being written by a scientist and appearing in a prestigious newspaper and all. Not hardly. Turns out that it was actually a rehash of old news while slapping leather with biblical creationists and Intelligent Design proponents. The ideas of panspermia (simple life that came from outer space) has been around for a long time. Since goo-to-guru evolutionists cannot account for the origin of life (abiogenesis) here, it must have begun out yonder. Somehow, existing life in space hitched a ride on a meteorite or something and survived the flaming crash to Earth. Such an idea just won't work. That doesn't solve the problem, it just pushes it back a ways. 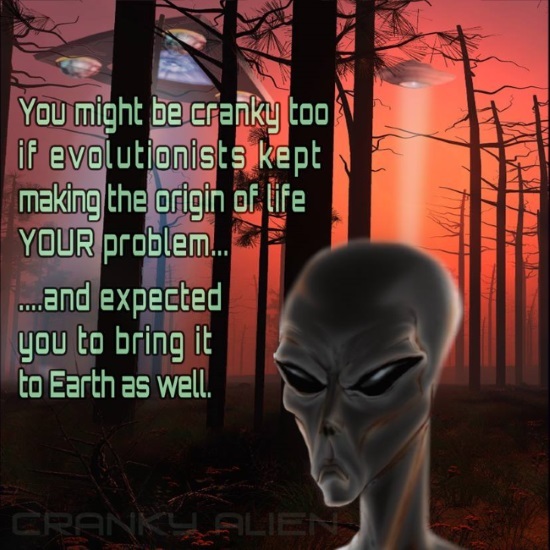 Worse than this, some even advocate directed panspermia, where aliens seeded life on Earth. That won't work either. Let's face it, both versions of panspermia are acts of desperation by people who want to deny the work of our Creator. The article by Haqq-Misra is loaded with logical fallacies, which are founded on the materialistic presuppositions that comprise his worldview. Expensive words aside, it means he has biased assumptions and works from there. In addition, he did not bother to do much in the way of fact checking. Haqq-Misra starts out by saying, "The public perception of intelligent design is that it is a scientifically specious, religiously motivated idea that seeks to explain away the notion of Darwinian evolution through magical thinking. Some incarnations of intelligent design can fairly be described as such." Fairly? No, this owlhoot is poisoning the well and using a straw man argument. (Also, did he survey the public himself, or used a legitimate survey? I doubt it.) Neither creationists nor ID proponents appeal to magic, and there is no legitimate way that Intelligent Design can correctly be called a creationist view. The writer said it was a "better" view version of Intelligent Design, but it was only a presentation of his materialistic assumptions and biases: if it's not materialism, it's not science. He didn't bother to look at the science involved in either biblical creation science or ID, else he might realize that bringing back the idea of panspermia, which is only conjecture, is simply unscientific. Jacob Haqq-Misra made his guesswork-laden presentation from his worldview. For a brief discussion on the article, you can read the third segment of "The Briefing" from September 12, 2016, download the MP3, or listen online.